Wool author Hugh Howey has been beating the drum for self-publishing for a long time — but now he claims to have data to back it up. 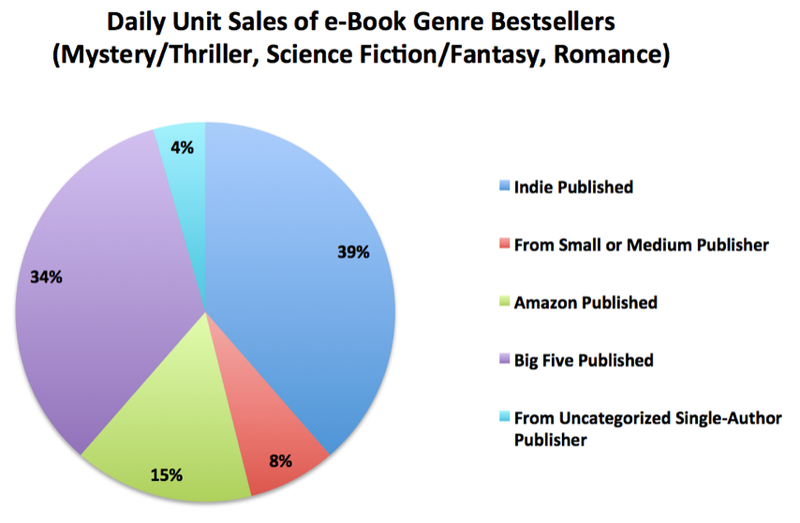 His new report on author earnings contains some startling figures, but none more so than the above chart showing indie authors beating traditional publishers on unit sales. As Howey himself admits, the data in his new "Author Earnings" report is incomplete at best, because publishers and booksellers (including Amazon) don't release raw book sales figures. You can find out exactly how much a movie made in its opening weekend, and how many people supposedly watched last night's TV shows — but book sale data is secret. According to Howey, this new data comes from "an author with advanced coding skills who had created a software program that can crawl online bestseller lists and grab mountains of data." The data all appears to be just for Amazon, which means you have to trust Amazon's accuracy on top of the accuracy of crunching the numbers. And there's also the fact that looking at unit sales is possibly misleading — if you sell 1,000 copies of a book at $1 each, you might be getting way more unit sales than an ebook going for $10 each, but the revenue will still be low. But Howey also includes some charts that claim to break down author income by publishing type, and they show a number of self-published authors making hundreds of thousands, or even over a million, dollars per year. What is presented here is but one snapshot of the publishing revolution as it stands today. That revolution isn't over. These reports can be run so long as books are ranked. Our hope is that the future brings more transparency, not less. Other artistic endeavors have far greater data at hand, and practitioners of those arts and those who aspire to follow in their footsteps are able to make better-informed decisions. The expectations of these artists and athletes are couched in realism to a degree that the writing profession does not currently enjoy. Responding to this report, book critic and regular Guardian contributor Damien G. Walter says what we're really seeing isn't just ebooks cannibalizing print books, but an example of "the principle of digital abundance" — people who wouldn't ever have entered a bookstore are snapping up ebooks on Amazon. Digital books are abundant. They are unlimited. And the economics of abundance simply does not play by the same rules as the economics of scarcity. The potential readership of ebooks is also abundant. Not unlimited, but in such large numbers it can almost be considered as such. Ebooks sell through smartphones and tablets, computers and the internet. Integrating ebooks in to the digital marketplaces of Amazon, Apple and Google has made them a mass consumer item in a way they simply weren't through bookshops. And the lower prices of ebooks at £1-£3 makes them impulse buys. Pull this together and you have a vastly increased book buying public measured, not in millions, but billions of people. The digital market for ebooks is a massive boomtown. And it's also something of a jungle, that magnifies the commercial pressures of the pre-existing print market. Genres work as a marketing tool in print because they hook buyers who aren't experts on books. This effect is vastly magnified in ebooks because so much of the expanded audience are only occasional readers. They're people browsing the Amazon store on their iPad and impulse purchasing, not just books but many things. "oh a book about Atlantis for 99p…buy!" And with literally billions of people doing this, it's hardly surprising that a lot of writers as selling a lot of books. And Walter argues that the new and rapidly changing ebook market will have to increase its quality levels soon, or risk collapsing. Both Howey's report, and Walter's response, are well worth reading.